Maybe it was wishful thinking, but when Marjorie Zarbaugh’s mother went shopping one day in 2011, she would have never guessed what would happen several years later. Zarbaugh’s mother had always wanted grandchildren. She was out shopping one day when a cute little dress caught her eye. On a whim, Zarbaugh’s mom decided to purchase a “First Impressions” dress for a baby girl from a Macy’s department store in Winter Haven, Florida. Of course, Zarbaugh herself wasn’t pregnant at the time so her mother kept the dress to herself. Seven years later in 2018, Zarbaugh was finally able to tell her mom that she would become a grandma. Her mother was thrilled and thought it’d be the perfect opportunity to give Zarbaugh the dress she had bough all those years ago. 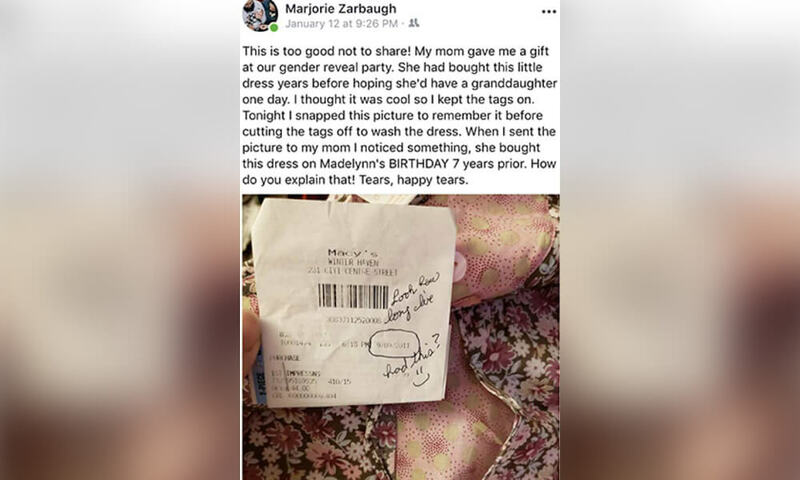 Zarbaugh held a gender reveal party in May 2018, where her mother gave her the dress as a gift. The dress came with the original receipt on which her mother wrote, “Look how long I’ve had this? :)” with the date circled. Zarbaugh was touched and kept the receipt. Four months later, she welcomed a baby girl named Madelynn. On January 12, 2019, Zarbaugh decided Madelynn was big enough to finally wear the dress her grandma had bought for her. When she looked at the receipt once more, Zarbaugh couldn’t believe it. The date of purchase on the receipt was listed as September 9, 2011. Coincidentally, Madelynn was born on September 9, 2018. Be it an act of serendipity, but somehow Zarbaugh’s mom predicted the exact date of her future granddaughter’s birthday seven years before it happened! Zarbaugh wrote on her Facebook page, “How do you explain that!” Perhaps it was mother’s intuition.